The relationship between employers and employees is fundamentally changing, but your hiring and HR practices may not have caught up yet. People expect more from you as an employer—more transparency, more accountability, and more trust. And you need more from your employees—not only their technical skills, but also their ability to think creatively, collaborate effectively, and adapt quickly. This report is based on a survey of over 5,000 talent professionals in 35 countries, behavioral insights on how people use LinkedIn, and conversations with experts and employers like Starbucks, Cisco, and Sodexo—all to bring you actionable insights and advice on these four trends. You can download the full report now to get all the new original research to inform your strategy and tactical tips to help you take action. Read on for a brief overview of each trend. While hard skills are about doing specific technical tasks, like tax accounting or graphic design, soft skills are more about the way you do them, like your ability to creatively solve problems or work within a team. As automation and AI continue to reshape entire industries, companies, and jobs, strong soft skills—the one thing that machines can’t replace—are becoming absolutely vital. Soft skills can make or break a hire—and they can also make or break a company: 92% of talent professionals say they matter as much or more than hard skills when they hire, and 80% say they’re increasingly important to company success. But while everyone agrees soft skills are extremely valuable, most companies still struggle to assess them accurately—and only 41% even have a formal process in place to measure them. This growing disconnect between the demand for soft skills and the inability to identify them is reaching a tipping point. Some companies are starting to get serious about assessing them by standardizing their evaluations, trying unorthodox approaches, and turning to AI-powered tech solutions. The full report walks you through these tactics and offers tips and case studies from companies like Citi. Work flexibility, the ability for employees to work remotely or shift their hours, used to be a distinctive perk. Today, it’s increasingly an expectation. You might not get special attention for offering flexibility, but you will probably stand out for not having it (and not in a good way). 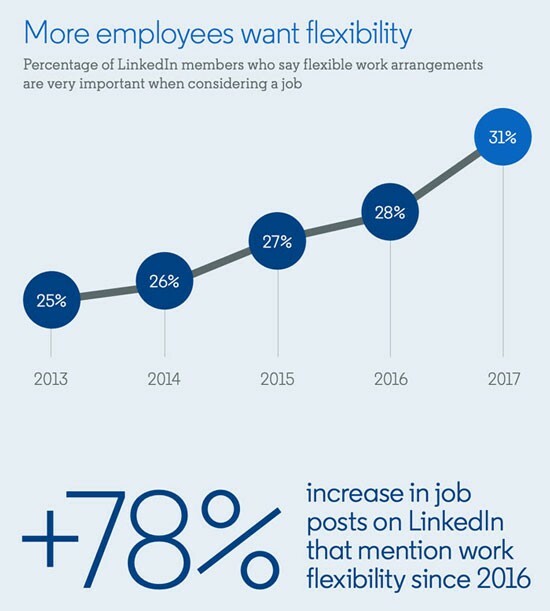 In just the last two years, there’s been a 78% increase in job posts on LinkedIn that mention work flexibility. 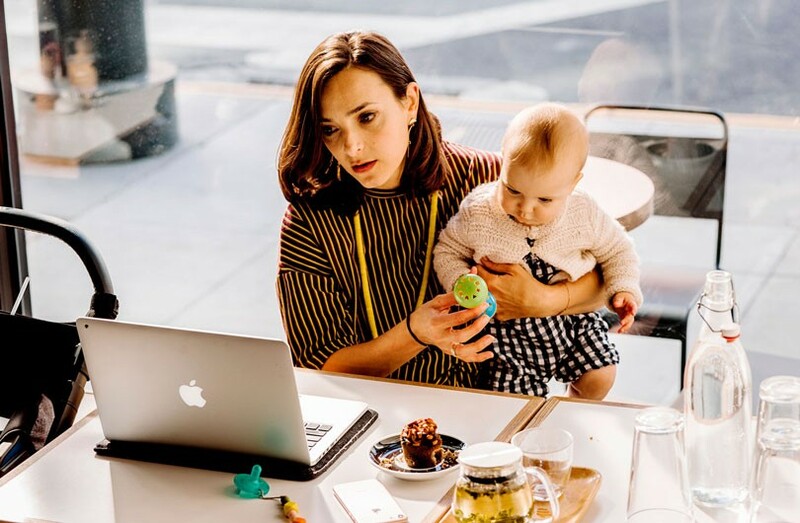 And in the space of only four years, there’s been a 24% increase in the number of people who say flexible work arrangements are a very important factor when considering a new job. Another reason it’s not a fuzzy feel-good perk: it can benefit the business as much as the employees. Along with improving retention, talent acquisition, and employee productivity, flexibility can save you a ton of money on real estate: Dell has saved an average of $12 million a year with its flexible work program due to reduced office space requirements. Along with these benefits, the full report also explores challenges of flexibility and how companies have overcome them. Preventing sexual harassment has always been a moral imperative for employers, as well as a legal one. But more and more, companies are seeing anti-harassment efforts as a business necessity as well. Hostile workplaces hurt your bottom line through turnover and a tarnished employer brand. The issue has resonated with employees: the amount of workplace harassment content shared on LinkedIn has increased by 71% year-over-year. These employees are looking for companies to do a better job of handling and preventing harassment—especially in light of the #MeToo movement and the way it’s underlined how pervasive the problem is. 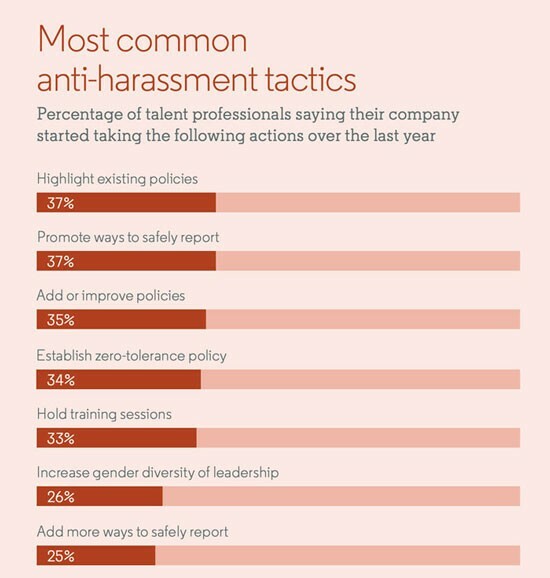 And companies are taking action: 80% of talent professionals say their company has started implementing at least one anti-harassment tactic over the last year. The most common tactics being used are arguably the easiest—highlighting existing policies and ways to report—but that doesn’t make them any less important. A common reason that many victims don’t report harassment is that they don’t know what will happen next and don’t want to lose agency and control of the situation. So making your policies and procedures crystal-clear and easily accessible online is one of the most important things you can do to encourage victims to come forward, according to experts. And while talent professionals aren’t experts, they still had some interesting opinions when we asked them which tactics are most effective. Their answers revealed two big gaps. First, there’s a gap between what tactics they believe in and what companies are doing. Most HR and hiring professionals say that adding new ways to safely report harassment is effective—but just 25% say their company is actually doing it. Second, there’s a gap between what men and women think is effective. 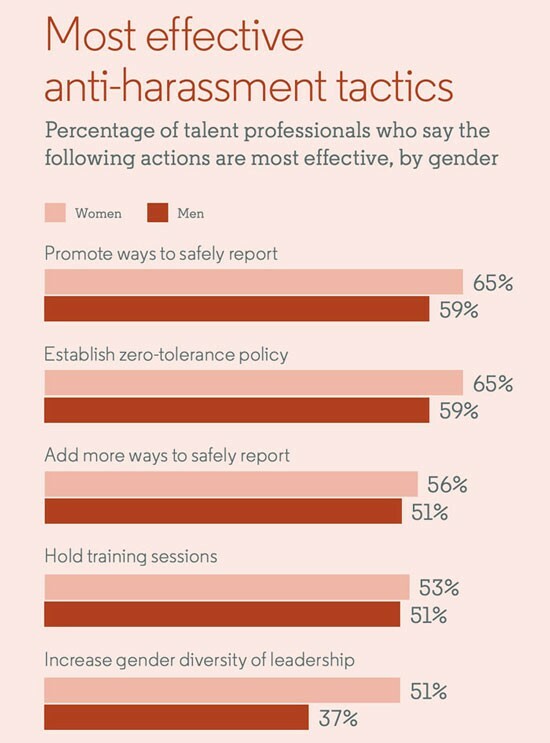 Most women think that gender-diverse leadership will help stem harassment, while far fewer men believe it’ll be effective. But, of course, there’s no single tactic that will solve harassment. Since preventing harassment and building respectful cultures are two sides of the same coin, companies are facing a cultural mandate, not a one-off HR play. The full report will walk you through 4 steps with 17 tips to help combat sexual harassment and create a safe workplace for everyone. Pay has always been a confidential topic in the workplace. Employers usually avoid the topic unless it’s time to make a candidate an offer or give an employee a raise. But leaving people in the dark can make candidates uneasy and employees distrustful: most people incorrectly believe they’re being underpaid relative to their market position. And now that it’s easy to share and see aggregated salary information on sites like PayScale and LinkedIn, companies are facing more pressure to own the conversation on pay. 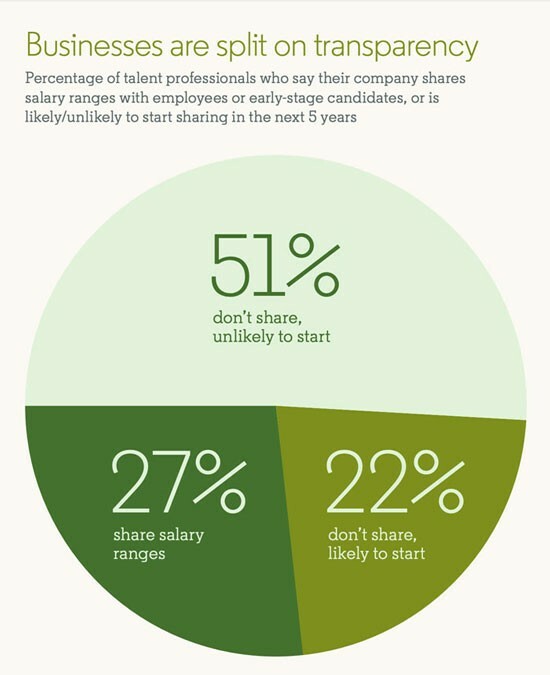 That may be why more employers are starting to proactively share salary information—and why many are planning to in the near future: 27% of talent professionals say their company shares ranges with employees or candidates early in the hiring process, and a further 22% say they’re likely to start in the next 5 years. Those who do share salary ranges cite many benefits—especially when it comes to speeding up the hiring process. Of course, pay transparency isn’t something you jump into immediately. It has real risks and complications, despite the bigger benefits. The full report can help you see whether pay transparency is right for you and how companies like Glitch, Buffer, and Starbucks have all embraced it differently. The needs of employees and employers are evolving. Staying on top of these four trends can help you stay competitive in 2019 and beyond. Assess soft skills accurately to future-proof your workforce in the age of automation. Allow employees to work when and where they need to for greater productivity and retention. Improve the way you combat sexual harassment to protect your employees and your employer brand. Trust your employees enough to be transparent about your pay policies to earn their trust in return. All of these trends are evolving at their own pace: flexibility is widespread in some industries while pay transparency is just now gaining traction. You’ll have to consider what’s right for your company and institute change thoughtfully. LinkedIn’s 2019 Global Talent Trends Report is here to help you do just that—evolve with and embrace the future of HR and hiring.